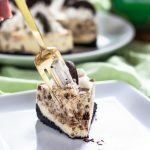 Make Instant Pot Cheesecake in a flash, and crumbles of the best Girl Scout Cookie will make it even better! Bring cheesecake ingredients to room temperature. Remove the cream from the Oreo cookies and place naked Oreos in a zipper bag. Crush Oreos into a crumble. Grease the sides of the pan with butter. Place crust in the freezer until ready to pour in batter. Crush mint cookies in a zipper bag. Combine cornstarch, sugar and salt in a small bowl. Set aside. Stir cream cheese using a stand mixer on the lowest setting and gradually add in the sugar mixture until fully incorporated. Do not overmix or use a high speed (it will add in too much air). Add sour cream and vanilla and stir until incorporated. Scrape sides. Stir in eggs, one at a time until just smooth. Fold crushed mint cookies into the batter. Pour batter into pan on top of crust. Tap the cheesecake on the counter until bubbles rise to the top. Pop with a fork and continue for 3 to 5 minutes. Place the steamer rack and 1 C. water in the bottom of the Instant Pot. Using a foil sling, lower the cheesecake onto the steamer rack. Seal the Instant Pot and set on Manual for 26 minutes. When it is completed, let it naturally pressure release completely. Remove cheesecake using the foil sling. Using a paper towel, blot the moisture off the top of the cheesecake. Let it cool down to room temperature before removing it from the springform pan and placing in the refrigerator. Chill cheesecake for at least 2 hours before serving. If you want to decorate or top your cheesecake, whip cream and other ingredients into stiff peaks. Pipe or spoon whipped cream on top of the cheesecake or slices at serving time.